A Chinese medical team from Hunan province in China has arrived in Freetown to offer free medical care to children, pregnant and lactating mothers. The team will join their colleagues at the Jui China-Sierra Leone friendship hospital where they would offer free medical service. The team leader of the visiting Chinese doctors gave a brief historical background in relation to medical support from China, noting that since 1973 the country has been sending volunteer medical staff to attend to the needs of Sierra Leonean patients. He said the move has helped promote progress between the two nations in the area of bilateral relations. Sierra Leone has a challenging health sector, which was severely hit by the Ebola outbreak in early 2014, adding that China has been very influential in supporting the country through the establishment, among others, of the China-Sierra Leone Friendship Hospital at Jui. Chief Medical Officer, Dr. Brima Kagbo, said they were happy to receive the team, adding that President Bio has placed key focus on the health sector in a bid to improve the lives of Sierra Leoneans in line with the Sustainable Development Goals. He said President Bio’s administration was also concerned about the capacity of healthcare workers to help reduce the high rate of maternal and infant mortality rate in the country. He noted that the president was also appreciative of the partnership in helping curb health challenges in the country. Minister of Health & Sanitation, Dr. Alpha Wurie, praised the initiative of mitigating infant mortality and maternal child healthcare, while lauding China for the initiative. 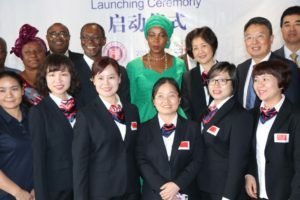 He pointed out that the contribution of China in Sierra Leone was very much visible in the area of health as well as in the infrastructure, stating that the prevalence of infant and maternal deaths was unaccepted and that the ministry needs more qualified healthcare workers to deal with the situation. He disclosed that currently the ratio of healthcare workers a patient is ten, adding that the 12 days free medical service was very good. Speaking at the event, First Lady Fatima Bio said healthcare issues for both women and children was very close to her heart because only a healthy nation could be transformed into a prosperous one. She noted that for the government to fulfil promises in education, it would need partners that can help improve the health sector. Chinese Ambassador to Sierra Leone WU Peng welcomed the medical team and noted that the initiative was based on people-to-people exchange between China and Sierra Leone which would in turn enhance bilateral relationship between the two countries. Ambassador WU said bilateral relations between the two countries have entered a new level and that he was committed to ensuring that China helps in all areas in the government’s priority.